As everyone knows, Mina and I love to cook. Lately, that has sparked some interesting requests. A few weeks ago, Mina asked me to make Angelina Ballerina’s mother’s Cheddar Cheese Pie for dinner. Hmmm… .I googled Mrs. Mouseling’s Cheddar Cheese Pie. Hey, who knows? Maybe somewhere someone posted the recipe! No, it was not going to be that easy. I spent the weekend looking up recipes to find something that would work. Then I bought a big hunk of Cheddar at Costco. I was ready! Mina took one bite of the finished pie and informed me that she was not a mouse and could not eat the rest…sigh…Tolga and I were eating Cheddar Cheese Pie for many days after that. Did I learn my lesson? No, no, I did not. The following week, Mina revisited her latest Skippyjon Jones book, Lost In Spice. While Skippyjon Jones is exploring Mars, his sisters are helping Mama June Bug Jones make Tuna Noodle Casserole in the kitchen. Coincidentally, I received a Bon Appetit magazine in the mail which contained—you guessed it—a recipe for Tuna Noodle Casserole with Leeks. I made the mistake of mentioning it to Mina and she was all over trying THAT recipe. OK, here we go again. Maybe, I am thinking, she will like THIS one. Ha! She took her one bite and spit it out. After eating a good portion of the casserole myself, I brought the leftovers down to The King’s English for them to enjoy the Skippyjon Jones Tuna Noodle Casserole. And I had enough of book-inspired dinners! From now on, we will just pretend. I reorganized my cookbook shelf and placed all her children’s cookbooks on the bottom shelf for easy access. 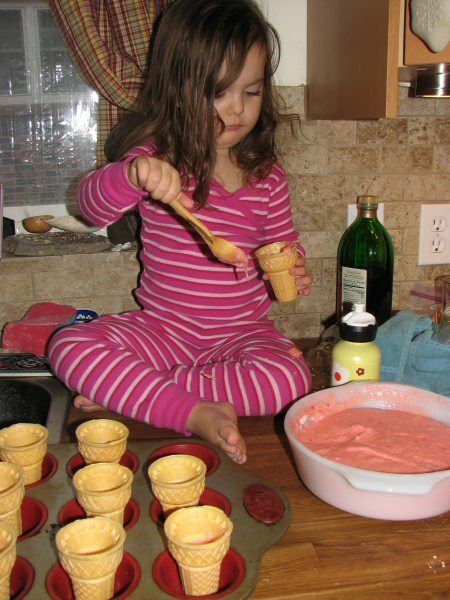 Sure enough, within minutes, she is whipping up “ice cream” from her new cookbook, The Silver Spoon for Children. It is a great book that I just HAD to buy at the last big sale at King’s English. The pictures are wonderful and easy for her to understand. And we have actually made quite a few recipes from the Betty Crocker’s Cookbook for Boys and Girls. Mom had gotten it for Mina last Christmas. I have Moms original up in my Cookbook section for safe keeping. The Ice Cream Cone Cupcakes were quite popular at our Valentine’s Day Workshop. Mom made me the Whiz Cinnamon Rolls for every holiday, with icing of course! Myself, I am in love with Eggs in a frame recipe. I took a cookie cutter and cut out a shape from a slice of bread, buttered one side, placed it in a pan, and then cracked an egg into it. YUM! We have quite a few more cookbooks that I have yet to crack open, but couldn’t resist buying: Pretend Soup and Salad People. Again, the pictures inside sold me right away. They are so fun and inviting! Personally, I think the book titles would make a great name for a children’s cafe! Hmmmm…..perhaps a future business for Mina? This entry was posted on Wednesday, March 3rd, 2010 at 2:51 pm and is filed under Reviews, What's In Mina's Book Bag. You can follow any responses to this entry through the RSS 2.0 feed. You can leave a response, or trackback from your own site.